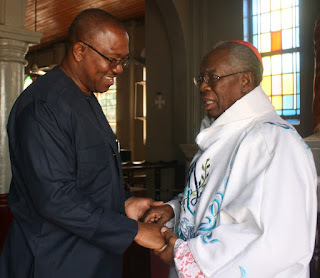 Vice Presidential Candidate of the Peoples Democratic Party (PDP) for the 2019 elections, Mr. Peter Obi, has commended Francis Cardinal Arinze on his 60th anniversary as a priest, describing him as Nigerian’s exemplary export to the universal Church. Obi was speaking on Tuesday in Lagos. Describing 60 years of priesthood as “no mean achievement,” Obi prayed to God to continue to grant Francis Cardinal Arinze the health of mind and body. Using Cardinal Arinze as an example, the former Governor of Anambra State said that he was among Nigerians that worked outside the country and yet rivalled the best. “When you look at people like him, who excelled both within and outside the country, you are persuaded to believe that the problem with Nigeria is not human resources, but getting the right people to take charge of the affairs of the country,” Obi said.